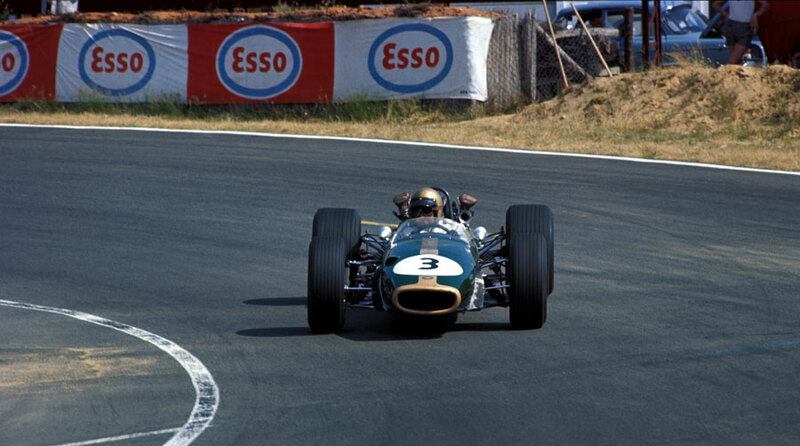 Jack Brabham won the French Grand Prix at Le Mans, in what was described by The Guardian as a "dull race on an unpopular new circuit"- Motorsport went further in referring to it as a "driving school circuit". Brabham was the fifth winner in as many races in what was proving a very open season, with team-mate Denny Hulme's second place giving him a six-point lead in the drivers' championship. French motor racing politics had dictated another change of venue for the French Grand Prix. The Bugatti circuit at Le Mans, often known as the "car park" circuit, was heartily disliked by most drivers because of its twists and turns making overtaking difficult. The crowds were also poor, with only 25,000 present for the race itself at a venue which holds 200,000, and small numbers turning out for the practices. Ferrari was in something of a mess following Lorenzo Bandini's death, Michael Parkes' serious accident at Spa, and Ludovico Scarfiotti unwilling to participate after witnessing both crashes, leaving it with one entry - Chris Amon. The grand prix took place in searing summer heat with the temperature topping 105ºF. The drivers engaged in a furious row with officials when it was decided they had to wheel their cars a long way to the start line rather than drive them there - the drivers simply drove there anyway. Then the grid assembled so far from the starter many could not see him. Graham Hill took the lead on the first lap but was passed by Brabham who in turn was overtaken by Jim Clark. But that was as good as it got for Lotus, who had missed much of the practice sessions as French customs had delayed the entry of its cars at Dieppe. Despite good early signs, both Hill and Clark were out within the hour with engine problems. Brabham was then left unchallenged with Hulme almost a minute behind, and the only challenge to a Brabham one-two ended when the throttle cable on Chris Amon's Ferrari broke soon after the halfway mark. Chris Irwin held on to fifth even though smoke was pouring from the back of his BRM for the last three laps. His pits urged him to continue, but on the final lap his car cruised to a halt, allowing the equally crocked Jo Siffert to stumble past him to take fourth.